Introduced back in 1996, even the very oldest Volkswagen Passats - dubbed B5 - have aged rather well. Introduced back in 1996, even the very oldest Volkswagen Passats - dubbed B5 - have aged rather well. 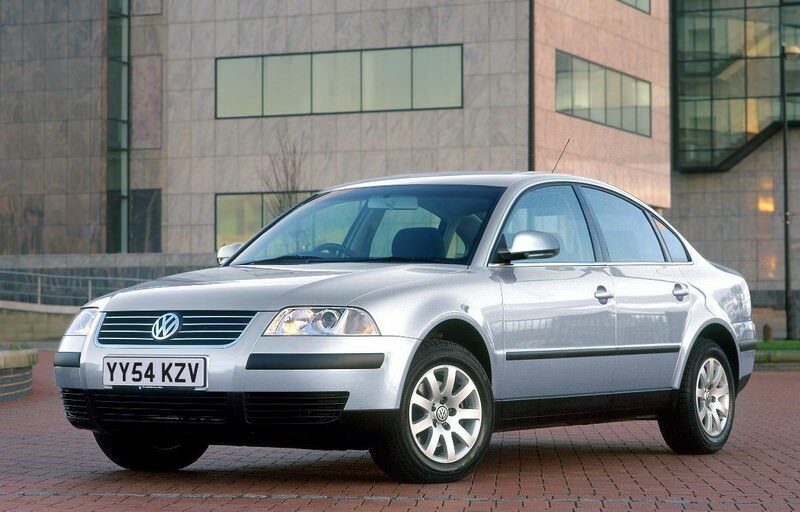 The first Passat to move the Volkswagen brand upmarket, the solid build quality and neat style was enough when new to tempt buyers out of premium badged machinery. It was offered in both saloon and estate guises, though the boot is so vast in the saloon as to make the estate all but redundant. Popular new means plentiful choice used at price points to suit any budget. In its almost nine-year production run, with a mid-life revision in 2001, the Passat was offered with a wide range of engine and transmission choices. The maddest Passat ever produced was the W8, its compact W-format 4.0-litre eight-cylinder engine loosely sharing some DNA with Volkswagen’s hypercar project via its Bugatti brand and the €1.5m Veyron. Hardly surprisingly this most exotic of Passat is near mythological in Ireland, as the majority of used Passats on offer are powered by a more mundane engine choice. Specifically Volkswagen’s 1.9-litre diesel unit. The 1,896cc turbodiesel engine has seen service in almost every Volkswagen Group model since its introduction. With good reason too, it providing a good blend of performance and economy, all mixed with agreeable refinement - once warmed through. Early examples came with either 90- or 110hp, later cars with either 100- or 130hp. There’s a 2.5-litre V6 TDI option on offer too for even greater performance, while the petrol engine line-up comes in 1.6, 2.0, 1.8 turbo, 2.3 V5 and 2.8 V6 guises, though don’t expect to find too many of those bigger capacity petrol engines in the classifieds. If you read '4Motion' on the specification that means it has four-wheel drive, but again they’re very unusual, as are automatics, the majority coming specified with manual gearboxes. In the competitive family saloon marketplace specifications count, and the count is relatively high on the Passat. Trim levels follow the usual Volkswagen format, with SE, Sport, Comfort and Highline, the latter particularly well appointed. It’s impossible not to recommend the 1.9 TDI engine in any of its states of tune thanks to its decent economy - none quote official consumption figures of more than 5.7 litre/100km. It has a bit of an old-school diesel rattle when idling or cold, but it’s not so loud as to be intrusive. The 130hp version offers respectable pace, though you’ll not feel short-changed by the lesser output models, as their mid-range punch impressive. Trim depends on budget, though SE and Sport are the most common, Highline desirable if you want a lot of equipment inside. The Passat is a solid, good-looking family saloon when it was introduced all those years ago and still a useful used buy today. Spacious and comfortable, the Passat isn’t going to excite like its contemporary Ford Mondeo might on the road, but then it’ll feel less like it’s worn out and tired. Plentiful choice means you can afford to be choosy, so take your time and find a classy, practical family car for not much money.